It was a beautiful scenic trip - last time I was here my mum drove from Auckland right through to Wellington. Everything was familiar but of course the train route is very different to driving through the Wairarapa. We passed a graveyard on the train and luckily my camera was out as I was able to snap a couple of photos! My Grandmother's beautiful dressing table. My cute Grandparents preparing lunch for Max and I... The paintings in the background were done by my Grandfather's mother many, many years ago! A photo of Max and I framed on their wall - Awww! They have so many dog and cat ornaments around the house! Getting lunch ready for Max and I... We helped and then cleaned up the dishes for them! 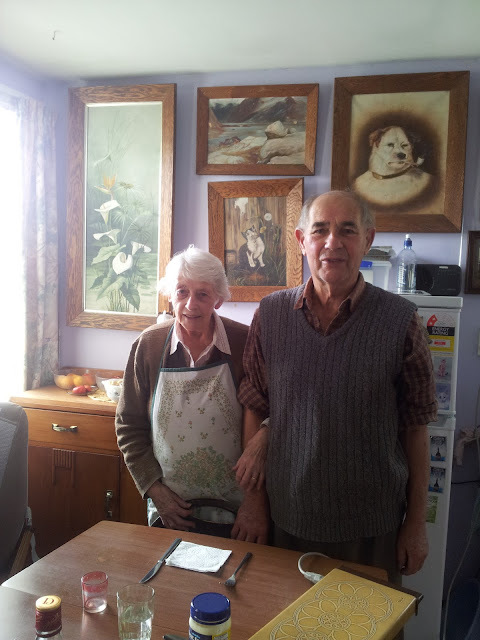 Well during our trip to New Zealand Max and I visited my Grandparents in Masterton... I think my photos and captions do most of the talking. They were very happy to see their granddaughter as it had been a couple of years since my last visit and they got to meet Max - who they loved! We had a lovely lunch using vegetables from the backyard and we chatted for hours... Later on y Grandfather took me to an op-shop in town and then took us for cake and tea (to come in a later post). The train trip was lovely and very scenic and it made me very happy to visit my grandparents as I knew they were over the moon to see me! So many cool stuffs ! What immensely sweet photos. I especially love the one of you and your grandma looking into the mirror together. There's something immensely heartwarming and precious about it.